Over the recent 1, 3 & 5-year periods only one of the Quilter funds analysed managed to maintain a top quartile ranking within their sectors consistently – this fund was the Quilter Investors Global Equity Value U2 fund. This fund sits within the Global Equity Income sector alongside 52 other funds that have at least one years performance history. Over the most recent 1-year period this fund returned growth of 6.78%, which was well above the sector average of 1.53% and was the 5th highest in its sector. Its recent 3-year growth of 50.29% outperformed 93% of its peers, and its 5-year cumulative growth of 78.14% was only eclipsed by the 79.16% returned by the consistently top-performing Newton Global Income fund. The Quilter Investors, US Equity Growth fund, has also shown promise, particularly over the recent 1 and three-year periods where it returned growth of 13.10% and 67.16% respectively. These returns were better than at least 81% of competing funds within the same sectors. However, over 5-years its cumulative returns of 103.41% were well below the Baillie Gifford American B fund, which was the top performer with cumulative growth of 161.29% over the same period. The four largest and most popular Quilter funds are their Cirilium range of multi-asset portfolios. The Cirilium Balanced, Cirilium Moderate, Cirilium Dynamic, and Cirilium Conservative portfolios hold combined assets of £8.5 billion, which accounts for more than 44% of the assets held in all 72 funds analysed. Each of these funds delivered competitive returns over the past 3 and 5 years, but over the past 12 months, they have struggled. The £3 billion Quilter Investors Cirilium Balanced Portfolio ranked 121st out of 150 funds in its sector as it returned negative growth of -3.14%. Equally disappointing has been the performance of the Cirilium Moderate, Dynamic and Conservative portfolios, each of which returned negative growth over the past 12 months. A poor 1 or 2-star performance rating was applied to 57% of 72 Quilter funds that were analysed. Among the poor performing Quilter funds was their £121 million Ethical Equity fund. This fund aims to achieve long-term capital growth and income through investment in a well-diversified portfolio of international securities issued by companies that demonstrate sound ethical practice. However, over the past 1, 3 & 5-years it has continually ranked among the worst performing funds in its sector. In the 12 months up to 1st December 2018, the Quilter Ethical Equity fund returned negative growth of -6.47%, which ranked 279th out of 288 funds. Over 5-years its cumulative growth of 45.64% was well below the 62.91% sector average and worse than 81% of its peers. 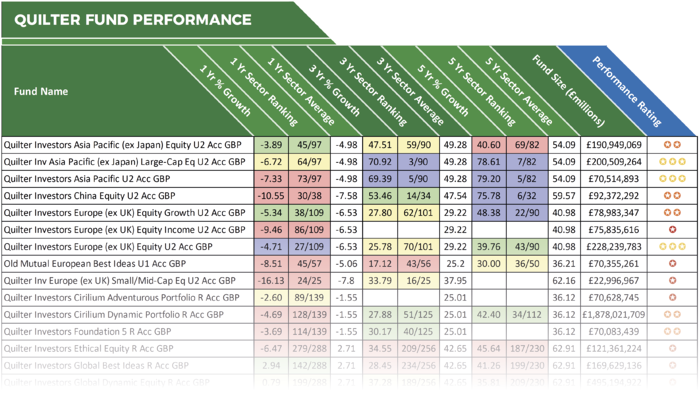 From all the 72 Quilter funds analysed, arguably the most disappointing was their UK Equity Income fund. Since its launch in October 2014 this fund has consistently underperformed, and over the recent 12-months, it returned negative growth of -22.96 %, which was the worst out of all 252 funds in the same sector. Its performance over the past 3-years has been just as disappointing. With 3-years cumulative returns of -24.33%, this fund maintained its unwanted status as the worst performing fund in the entire IA UK All Companies sector. With more than £19 billion of client money under their management, Quilter Investors Limited have a sizeable footprint in the UK investment market. Their Cirilium Multi-Asset portfolios, in particular, have proven to be a very popular option with UK investors. However, our analysis of 72 of their funds identified that a significant proportion has a history of underperformance, with less than 7% receiving a positive 4-star performance rating. 2018 has been a difficult year for many fund managers who faced depreciating markets have struggled to maintain growth, and clearly, Quilter has been no exception. Despite a challenging investment landscape, the fact is, the significant majority of funds managed by Quilter Investors Limited have been unable to match the returns of many of their peers.